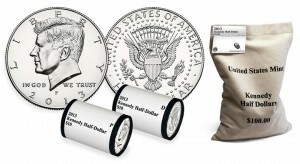 Debut sales are now available for 2013 Kennedy half-dollars that the United States Mint is selling in rolls and bags. Released on Thursday, collectors by Sunday ordered a total of 778,240 coins. Unit splits were 7,846 in two-roll sets and 2,322 in 200-coin bags. Of note, the combined starting total for this year’s release is higher than last year’s 2012 Kennedy halves which opened at 740,160. It is also better than the 2011 Kennedy halves which debuted at 776,440. Here is a quick breakdown of current sales and published mintages for the coins since 2011. Products with an asterisk (*) are no longer available. Each of the Kennedy half-dollar products were popular sellers for the U.S. Mint last week. Overall, 36 numismatic products outperformed their prior gains compared to 30 previously. Still, the prior sales report included higher volume sales and better numbers among bigger ticket items. Clearly, plummeting precious metals prices has dented demand for numismatic gold and silver coins. But as long as gold does not careen lower, there should be a pick-up in sales for gold coins as the U.S. Mint cut their prices on Wednesday by $100 for every ounce of gold content. While sales for numismatic gold and silver coins were pretty much lethargic, that was not the case over the last seven days for bullion coins. Bullion sales strengthened for gold coins and surged for silver coins. The following grid provides the latest weekly and monthly sales for all U.S. Mint bullion products. The weekly period covers sales from June 20 to June 26, 2013. The following tables offer the latest sales for U.S. Mint collector products. The sales period covered is from June 17 to June 23, 2013. Products with an asterisk (*) are no longer available. 2012 Issue* 42,223 42,223 NLA #VALUE! Can anyone explain how the 5-star general 3-coin set is seeing -151 pieces to the change? Is it cancellation? I thought the fulfillment of all orders was completed months ago. I called the mint. They said the minus 151 was due to people returning the set because it or the coins were damaged. If the mint sent you a set with a coin defect, wouldn’t that make it more valuable? I don’t know. What I do know is they said that they melted the coins down. There are no re sales. So it will stand that there were less than 10,000 sold. hawk – You are thinking of an Error coin (recognized by the collecting community as an Error in Minting that was missed by Quality Control). Returns for “Defects” in this case are due to marks, including scratching and spotting (that decrease the value). Examine your coins well when you get them from the mint.